July 29, 1952 the last Three-wheeler, a Ford-engined "F"-Super left the Morgan Worcs. 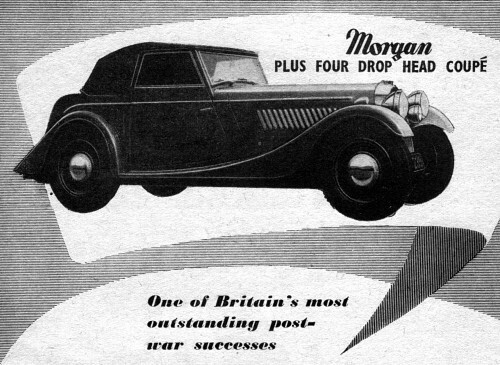 Morgan Plus Four, Four-Seater Tourer is an addition to the existing range (Tourer and Coupé). Generally similar to the two-seater sports models it differs mainly by having two extra seats, with the petrol tank carried beneath, a single spare wheel (two on the Sports) and a single 12-volt battery under the bonnet.